The Catholic Church must have a long and honest communal examination after none of its clergy showed up in Charlottesville on August 12. Muslims and Jews, despite their vulnerable status, arrived ready for whatever the day brought. Members of the United Church of Christ, Pentecostals, Methodists, Presbyterians, black and white Baptists, Evangelicals, Quakers, Episcopalians, and Lutherans came, among others. But when the interfaith procession of clergy left the church after our six a.m. sunrise service to march to Emancipation Park and block neo-Nazis from gathering, there were no Roman collars to be seen. I have heard people express regret for not being present, but the problem is not a lack of individual commitment; it is systemic. How long has the Catholic Church failed to show up for racial justice? How many of us heard nothing in the pews on August 13 of the brutal beating of 20-year old Deandre Harris, who broke his wrist and needed eight staples in his head, and the murder of Heather Heyer at the hands of white supremacists? 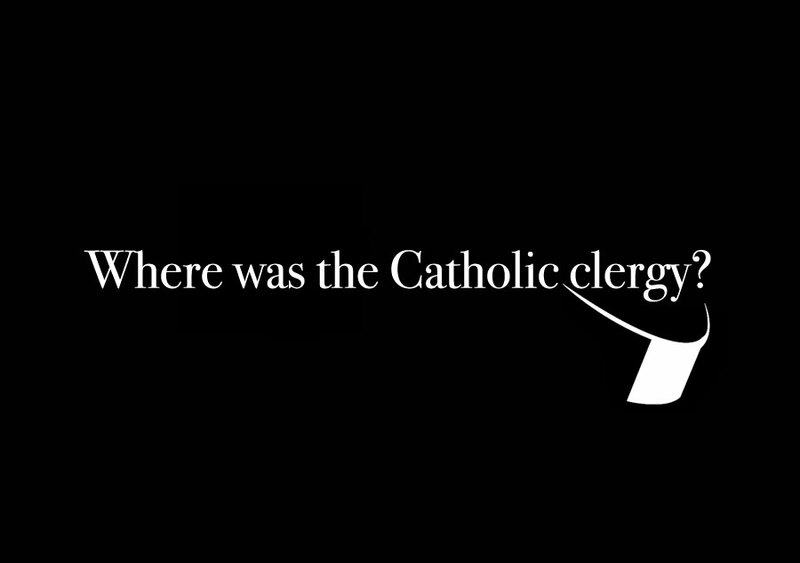 While the silence many of us encountered that morning sent a loud message, it merely echoed that U.S. Catholicism has never sufficiently grappled with white supremacy. This gross negligence did not simply happen but is the product of habit. Walking and singing with the clergy that day raised many questions I do not know how to answer. When we lined up in the street and faced people who chanted “commie scum,” “heretics,” and homophobic slurs at us, I wondered what it meant to love our enemies. A facile understanding of that gospel mandate would endanger our vulnerable neighbors, who we are not only called to love but to labor against the injustices they unfairly bear. If loving the neo-Confederates does not entail interfering with their mobilization to create a Christian and white nation, then we fail in our responsibilities to people of color, Jews, and Muslims. Such a passive idea of love also fails to recognize that they too are poisoned by their ideology of separation and contempt. What does loving our enemies and neighbors look like when one is trying to eradicate the other? I certainly did not know that day, and I am afraid too few in our church do. Thomas Merton wrote to Dorothy Day in 1961 that “we have to remember the terrible danger of projecting on to others all the evil we find in ourselves.” It is a call to humility that fits with Jesus speaking of the log in our own eye and Nathan rebuking King David for his hypocrisy. But how do we balance this wisdom with the pressing need to name evil, exploitation, and oppression? We do not need to wring our hands when we assert that Nazism is evil. It seems we have neither come to terms with Merton’s insight nor the immediate need to resist forces that seek genocide in our own streets. Can we recognize that the murderer who drove his car into a crowd is not alien to us, that he is animated by the same breath of God as we are, and refuse to see ourselves as more valuable than him? And can we at the same time permanently banish the absurd patience from the pulpit with the racial conditions that gave space for such an attack to happen? How can we uproot in the seminaries, the universities, and the parishes the widespread and long-running impression that Catholicism does not demand concrete struggle against social evils? A number of pacifists have asked about the relationship between the clergy and the antifa’s willingness to protect the community with violence. But surely we must recognize that the church’s persistent absence simply makes such a response more likely. If we as a community hope for a witness against neo-Nazis in keeping with Christ, we must provide it or tacitly endorse the predictable results. It was only after a group of white supremacists with shields and sticks broke through the small barricade of clergy blocking the park that antifa decided to form their own. I will always be grateful to the I.W.W. for offering to form a line in front of us, and we as a community must ask why they showed up when we did not. The violence did not start when white supremacists viciously attacked the antifa. The preparation for battle was evident in every weapon and helmet; it was carried in each weaponized heart. We all brought the violence with us. But if we are to truly be a church on the margins, we must engage the Wobblies and antifascists. The French worker-priests that Dorothy so admired knew that what the official church saw as a dangerous space was in fact the site of their mission, so they immersed themselves in the labor movement and the factories. Rather than viewing communists as a threat, they held confidence in their ability to maintain a Christian witness while working with them. So too should we now read the signs of the times and discern our role in this new manifestation of an old cruelty. It is not that the official U.S. church has refused to take a stance, it is that there has been a collective refusal to acknowledge white supremacy in a meaningful and sustained way. That in itself is a position that leads to the violent, white patience pervading our community today. If the official clergy were absent, however, the Catholic Workers and the laity were not. There was Sue Frankel-Streit of The Little Flower Catholic Worker, roaming with her fellow “puppetistas” and present to those at the horrible murder scene. Laura and Steve Brown of the Casa Alma Catholic Worker in town acted as jail support and prayed with groups that gathered. I think too of Katie Sellers from Cincinnati and chaplains Kathy Kelleher and Kate Gerne from Boston, the only people to respond to a wide call to Catholics. Rabbi Abraham Joshua Heschel said that God is in search of humans, and the distance these women traveled is a sign that we can incarnate that divine pathos for each other. It was a grim and awful day. Most of us grew frustrated that we could not do more. We simply offered a countervision, a different way to live and be, free of weapons and the desire to dominate. When insults were shouted, we prayed and clapped and sang “Oh, Freedom” and “This Little Light of Mine.” That was our “accomplishment.” We stood there proclaiming in our songs, in our linked arms, in our prayers, in uniting Muslims, Jews, and Christians, that in this terrible time something else is possible. As a queer, ordained woman led us through the day, I marveled at what we as a church choose to denounce with more zeal than white supremacy. The lack of Catholic clergy in Charlottesville was merely a reflection of our doctrinal priorities. But the puppetistas, the jail support, the women from far-off towns, and the many Christians, Jews and Muslims offered another way. They were the leadership representing the people of God, making straight the way in the spiritual wilderness and showing us how to become the beloved community. Eric Martin is a doctoral student in historical theology at Fordham University in New York. This piece was previously published in: The Catholic Worker (October-November 2017 issue, page 3). It doesn’t exactly take the Catholic church off the hook, but there were mitigating circumstances in Charlottesville. The priest in the nearest church was from Uganda and on August 12 was in Uganda with a dental missionary team. For Sunday mass that weekend, they had a priest from New York who was filling in. Charlottesville is in the Diocese of Richmond, and its bishop, Francis DiLorenzo, was dying; he died on August 17. So the events in Charlottesville caught the Catholic Church at a time when no one was immediately on duty to respond. I wasn’t there myself, but I have the data about the parish from a Charlottesville resident. This is powerful and necessary – thank you. As to the comment above, I am thinking of all the clergy from other faiths who found ways, despite their own Sunday obligations, to be present having come from towns and cities far away. Not a challenge, but just a counterpoint. Great piece of writing. Religion has important role in bringing the masses to action, and the catholic sects complicit inactivity is right to be called out. As a graduate from Catholic University of America, this topic crossed my mind often. I wonder why same student body who turned out in droves for the March for Life did not attend/show interest in any Black Lives Matter events or discussions. Thank you for putting this into words.